A great way to build a stockpile of free toiletries is to use your dollar-off coupons to buy travel-sized products. The selection of travel-sized items has grown over the years because the demand has increased since airport security has tightened, and manufacturers make a bundle off the markup. However, for couponers, buying trial sizes can mean baskets full of free products. 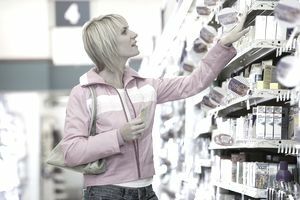 Trial-sized products are generally priced around $0.97 and most of the products are from manufacturers that issue coupons. For example, you can get trial sizes for Colgate, Scope, Degree, Dove, Tide, Shout, Johnson's Baby Powder and the list goes on. You can also find coupons for at least $1 off on these same products. What happens when you mix $1 off coupon with a tube of Colgate that costs $0.97? It becomes free toothpaste or even sometimes a slight moneymaker in stores that allow coupon overages. When I talk to people about using coupons on travel sizes, one of the first questions that I am asked is, "Isn't that a waste of a good coupon?" No, it is not really a waste. Take a look at all the expired $1 off coupons that many of us have for products that are available in travel sizes. A waste of a good coupon is one that you let expire when you could have used it to get a good product free. The second question is, "What in the world would I do with a bunch of trial-sized products?" This is my favorite question because it always gets my frugal-mind churning. There are so many things to do with travel sizes, especially when they are free! Trial-products are great to keep in a purse, diaper bag and the glove compartment. Belong to a gym? You can keep them in your gym bag or locker. They are the perfect size to keep in an office drawer. Anyone involved in outdoor sports like boating, golf, hunting, fishing or camping will enjoy having these little space-saver refreshers around. They are also the perfect size to revamp a first-aid kit for your home and car. Trial-sized products are wonderful for gift baskets for friends that travel, students heading off to college, co-workers' birthdays and holiday gifts, as "way to go" gifts for friends that have purchased new cars, or are going on a cruise, joined a gym or started a new job. If you have guests coming to visit, a nice way to welcome them and add to their comfort is to fill a pretty bowl with a nice selection of travel products. Add a few rolled-up wash cloths or hand towels and a note to let them know how glad you are that they are there. They'll feel special. Does your daughter want to have a sleepover with her friends? A fun surprise would be bags for each of her guests, filled with shampoos, conditioners, creams and soaps. They will feel so grown up. A popular gift for new parents is a basket full of baby products. Use trial-sizes of baby products as fillers. This will also give them an opportunity to try out products for the first time. Relatives who have a hard time getting to the store will appreciate receiving a variety of sample-size toiletries, over-the-counter medicines, hand soaps and other useful products. Not only will it save them money, but it will also save them space. Planning a corporate event? Provide the attendees with a welcome package and include travel-sized items. Not only will they have what you give to them, but they will also have what is left in their hotel room. A great place to take travel-sized products, as well as other items that you have stockpiled, are the homeless shelters in your community. Any time that you have a coupon that turns a price tag into a free product is the best time to buy, but many couponers wait until their coupons are nearing expiration. For those of you who are skeptical about the value of using coupons for free trial sizes, let's look at it another way. Say that you have four coupons for $1 off Gold Bond Powder and that you can get four two-ounce samples free when you use your coupons. If you use your coupons, the total that you will pay per ounce is zero. You could also buy it for $7.79 for 10 ounces, minus the $1 coupon and you would get it for $6.79 or $0.68 per ounce. Which one is the better deal? Zero per ounce or $0.68 per ounce? Yep. Free is always better and you would only be two ounces short of the larger size. You might find that registers start to beep when you check out with your coupons on trial-sizes. This can happen for a few reasons. First, many coupons will list trial sizes as an exception, which means you cannot use that coupon. If you see “excludes trial sizes” that means you cannot use it. Secondly, if using the coupons causes an overage and the store does not give coupon overages, the cashier probably forgot to adjust the coupons down to the price of the item. Couponers often sound off about problems they have at stores using coupons on trial sizes. It can turn a smiling cashier into one that begins to growl if the register is hung up. Remain calm and patient and hopefully you will have a copy of the store's coupon policy handy. Don't be shy about pulling it out to show to the cashier.